Why is the smile embouchure not a good thing for flute players? This came up as a topic for discussion on one of my flute groups, and I had a great time trying to explain my "take" on it. I put everything I knew about "Why isn't it a good idea to smile to form a flute embouchure?" here in this pdf article. Please read the above pdf and then comment below. Also see: Walfrid Kujala's three part "Jaw Boning" article from 1987 (search University library periodicals or contact Flutetalk magazine). Also see: A previous Cluff-blog reference to the Kujala "how to" article concerning the jaw and flute dynamics. Nyfenger's Music and the Flute book where he explains the jaw is configured to bite, chew and speak, and how to avoid jutting the lower jaw forward which is its weakest position. Please comment using the button below. Sorry, there's not much I can do. You could send the links for Galway's youtube embouchure video to your teacher, I guess. Very many thanks for this latest piece about embouchure shape, which is fascinating. 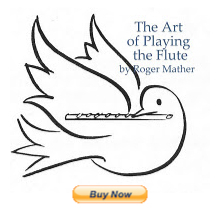 I had lessons in the 70s (as an adult) from a leading orchestral flautist, who played a wooden flute to great effect. I'm desperately trying to remember how he taught me to hold my mouth but whichever he told me I don't now use the smiling embouchure with either silver or thinwood headjoints. Incidentally, the wooden headjoint is my favourite - having a glorious rich tone. Can I also thank you again for your brilliant and stimulating website. Thank YOU, David, for this info. Very interesting. This "Smile Embouchure" information, coupled with the jaw jutting article (and your YouTube item) are most interesting and valuable. I was mostly self-taught back in the late 1940s and the elementary book I had showed a smile method. By trial and error I found that I could improve my tone quality by opening my jaw, and I subsequently played for many years with a mostly open jaw. With the open jaw, I couldn't maintain the smile, though, and so I gravitated toward a straight embouchure and later into a frown-like lip shape. As a late-in-life returner, I still find that the open jaw gives a rich, full tone, when used in both lower and middle registers, and I suspect it will once again in the third register, after a bit more practice. If I want a shrill tone I just close the jaw and out it comes. I think the Tom Nyfenger book showed me one great trick to the third register that helped me most when I first read his book "Music and the Flute". Using the same idea as closing the teeth, use a vertical closure of the lower lip upward against the upper lip. This really makes leaping into the third register super legato if combined with increasing air speed etc. Best, and thanks so much for your positive reinforcement! Terriff! J. However, I find it easier to raise the lower lip vertically, rather than pull the upper lip downward vertically. Try both (with open teeth, of course, for that open sound quality we love!) and tell me which works best for you. Maybe it's a mouth-shape difference, or simply a conceptual difference. Best, J.
I've got a problem because i've always used the smiling embouchure and never had it corrected until very recently by a new flute teacher. I'm a student and have done my grade 8, however, my teacher has told me that to progress further I must have the 'normal/correct' embouchure. How can I go about changing the habits of a lifetime? My mouth just naturally forms the smiling shape and it gets very frustrating trying to do the straight embouchure as i can't even get a sound out of the flute when i try it. The James Galway embouchure video hasn't really helped as seeing someone else do it doesn't seem to be enough. Can you help me? "To change the habit of a lifetime" does take time. Be patient, explore, and give yourself time. Also remember that you can experiment on the headjoint only (much easier)to establish new habits. There's nothing more I can do by typing text; it's all about patience and exploring. Werner Richter's book from www.fluteworld.com called "Conditioning training for the embouchure" may really help. I've actually never seen anyone play with a smile embouchure before...very curious. It is something I'll watch out for in future students though. However, I was wondering what your take on playing with a pretty severe frown was. I saw a great piccoloist for a professional orchestra play like this and it must work for her, but I'm wondering how good of a thing it is to do in general? It seems like extra muscle work whenever piccolo can be taxing enough as it is. This is an interesting thread. I've never thought about using my jaw before, I've always just played, but then this week read that both Katie Blocki and Edwin Putnik tell students to jut their jaw forward on the high notes, so I thought I had missed out on some important information! But now I see that others don't recommend that at all. I guess I'll just keep doing what I'm doing. - possible strain of the jaw joints (TMJ) over time. So good thing you're thinking about trying other ways. Jutting can work at first for novices/beginners, but has long term problems. The "smile" embouchere is the method used by saxophonists who double on flute and who aren't aware that you can't play a flute the way you play a saxophone (I'm a saxophonist, and I've learned this in studying flute). Needless to say, the best saxophone/flute doublers (Eddie Daniels, James Spaulding and Sam Rivers, to name a few) have had professional instruction on the flute. I don't recall ever seeing anyone whose primary instrument was the flute playing with a "smile" embouchere. I think the "smile" was more used for 1950s flute students whose lips were thicker. Thin lipped people actually need a certain amount of "pursing" wheras those with thicker lips need more stretching and smoothing at the lip centers. Moving the corners excessively however makes the "air-reed" too long for control over the three octaves intonationally and unified in tone colour. So I have thick lips and have generally played with a smile embrouchure. Is this ok because I have thick lips or should I work on changing it. Although when I do the straight jaw one it feels as if my tongue has to go into a different position and makes the part below my tongue feel very abnormal. Suggestions? Is it worth changing? You have to consult a flute teacher in person. One can't judge embouchure from email-self-descriptions because the reader can't hear the tone quality and see what the player is doing when the tone quality improves. So only live teaching helps answer these types of finely-detailed questions. Can Jen or anyone else who cares to chime in describe HOW my embouchure--my mouth, jaw and lips--can remain dynamically relaxed, rather than getting stiffer and stiffer as the phrase goes on. Once I take a breath, I can regain a sense of being relaxed enough to feel a very good embouchure forming, however when I get stiff as the phrase progresses, of course, my embouchure (thus my tone) suffers greatly. It's frustrating. I do have decent though not perfect breath control, and perhaps here is where the answer lies? You say that your jaw and lips get stiffer and stiffer the longer you play a phrase? That's the opposite of what they should be doing. Do you have a teacher? There is a stage when self-teaching flutists think that they have to, at any cost, learn to play longer phrases without stopping to breathe. In an attempt to squeeze the last drop of air into a long phrase, they close their jaw and lips to pressure-push the air out through a tiny, tight embouchure. This is corrected immediately in a flute lesson, as soon as the teacher hears it. It means that the student is needing a new series of techniques, so they can eventually achieve their goal of longer phrases, but not through tightening. So this is the exact moment to seek lessons. People have been telling me that I've been playing with the wrong embouchure yet everybody says my tone in all ranges are very nice. Should I change my "smiling" embouchure? If your tone is "nice" that's great. But later development calls for a flexible tone with a wide range of "tone colours". If you can achieve a large range of colours, dynamics, fine-tuning of intonation etc. then whatever you're doing is working. But if you have very little flexibility, you will want to use less smiling.